The conventional keratoconus classification system, originated by Amsler/Krummeich, has for many years been the standard approach to early detection of keratoconus. However, this system only takes the anterior surface and central thickness of the cornea into account. New ophthalmic diagnostic instruments such as the OCULUS Pentacam® are also able to map the posterior surface as well as pachymetry over the entire corneal area. The new ABCD classification system developed by Prof. Michael Belin, USA, uses the now measurable tomographic data to distinguish 5 grades running from 0 to 4. It is based on a study published jointly by the three major cornea societies of Asia, Europe and America: Global Concensus on keratoconus and ectatic diseases, Gomez JA; Tan D. Rapuano; Belin MW; Ambrósio R Jr; Guel JR; Maleacaze F; Nishida K; Sangwan VS, Group of Panelist for the Global Delphi Panel of Keratoconus and Ectatic Diseases Cornea. 2015 Apr;34(4):359-69, www.ncbi.nlm.nih.gov/pubmed/25738235. This worldwide consensus served Prof. Michael Belin as a basis in developing a new display for the Pentacam®/Pentacam® HR as well as the new Pentacam® AXL. The new Belin ABCD Keratokonus Staging Display shows, at a glance, all parameters relevant to keratoconus classification, including the posterior corneal surface. The display can also be put to retrospective use, i.e., for classification of a patient’s earlier examination data. 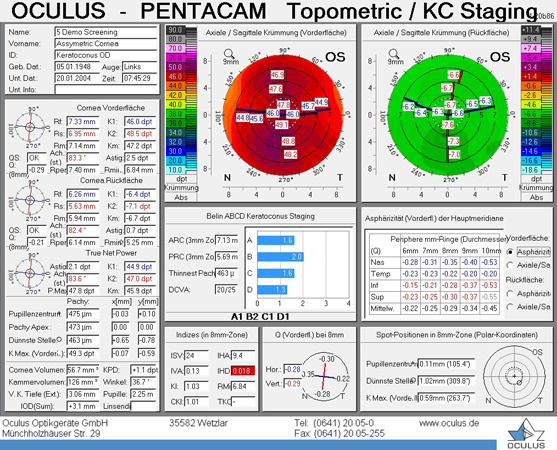 It has been incorporated into the Pentacam® Basic Software Package, where it can be called up via the Topometric / Keratoconus Staging Module. It is available to Pentacam® users through a free update. The availability of products and features may vary by country. OCULUS reserves the right to change product specifications and design.